Sergei Skripal Is 'Improving Rapidly,' But His Cat And Guinea Pigs Are Dead : The Two-Way Even as the Russian ex-spy and his daughter Yulia recover from poisoning, the international dispute it caused has developed a peculiar new front: the Skripals' pets. The main entrance to the Salisbury District Hospital in southern England, seen early last month after Sergei and Yulia Skripal were admitted after their poisoning. On Friday, hospital officials noted that both father and daughter have been improving. One month after Sergei and Yulia Skripal collapsed on a shopping center bench, apparently poisoned, the Russian ex-spy and his daughter are showing marked signs of improvement. Hospital officials announced Friday that Sergei is "responding well to treatment, improving rapidly and is no longer in a critical condition," just one week after his daughter reached stable condition. 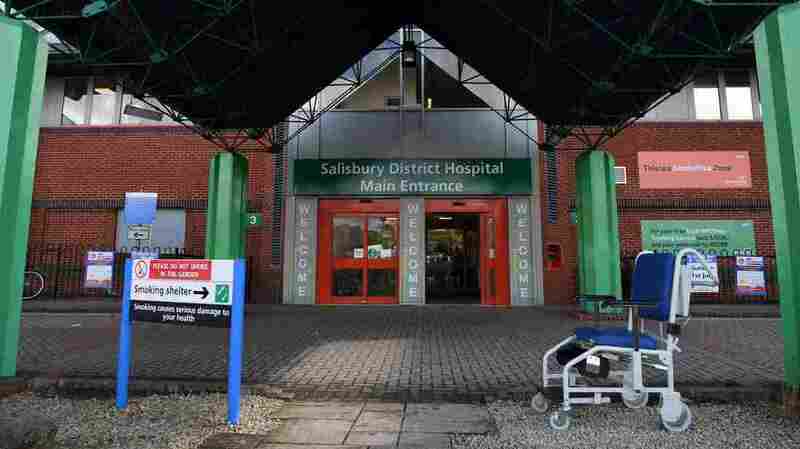 "As Yulia herself says, her strength is growing daily and she can look forward to the day when she is well enough to leave the hospital," Christine Blanshard, medical director at Salisbury District Hospital, said in a statement released Friday. Their pets, however, were not so fortunate. They stayed behind in the Skripals' home, which was quickly sealed off by British authorities. Investigators later found that their front door showed the highest concentration of the nerve agent used against them. "When a vet was able to access the property, two guinea pigs had sadly died," a spokesperson for the U.K. Department for Environment, Food and Rural Affairs said in a statement to NPR on Friday. "A cat was also found in a distressed state and a decision was taken by a veterinary surgeon to euthanise the animal to alleviate its suffering. This decision was taken in the best interests of the animal and its welfare." The tragic fate of the three animals concerns not just the Skripals. Since father and daughter fell ill, their poisoning has become the focal point of an international dispute, with the U.K. alleging that Russia was behind the attack. British officials have identified the substance as novichok, a nerve agent created in the Soviet era and closely associated with Russia in the decades since. The Kremlin, for its part, has dismissed claims of its wrongdoing as fabrications aimed at "large-scale political provocation." In the month since the attack, the U.K. and many of its Western allies, including the U.S., have expelled scores of Russian diplomats in retaliation — and Russia has retaliated by expelling those countries' diplomats in turn. A Russian spokeswoman brought up the Skripals' cat and guinea pigs directly, Wednesday, when the Organization for the Prohibition of Chemical Weapons convened a special meeting to address the incident. "Where are the pets? What is their condition?" said Maria Zakharova of the Russian Foreign Ministry, according to The Associated Press. "This is about living creatures, and if a toxic chemical agent was indeed used in their house, these living creatures should have been hurt." CNN, citing an environment department spokesperson, says the guinea pigs likely died "due to a lack of water," while the BBC reports that the cat was put down due to extreme dehydration. In both cases, the BBC points out, "they weren't killed by Novichok nerve agent." It’s not clear when police knew of the presence of the animals in Mr Skripal’s home or whether anyone considered rescuing them. It had been sealed for operational safety reasons. Zakharova took to Facebook on Friday to express her disbelief after the news surfaced: "There was a search, but they didn't notice the animals? Didn't notice the pets of a person who was poisoned with nerve gas?!!" The press secretary for the Russian Embassy in the U.K. echoed that disbelief, noting that "it is said unofficially" that the animals were cremated. "It remains unclear if their remains were ever tested for toxic substances, which would constitute useful evidence, and if not, why such a decision was made." "Overall," the official added, "it is difficult to avoid the impression that the animals have been disposed of as an inconvenient piece of evidence." British officials, meanwhile, say they are "absolutely" certain that Russia — and likely even the Kremlin — lay behind the poisoning. "They have a track record of using nerve agents, and they have a track record of state-sponsored assassinations," Kim Darroch, the British ambassador to the U.S., told Here & Now on Friday. "Add all of that together — not just us, but in the court of international opinion, because I think 28 nations have taken action against Russia — and there's no doubt in our mind of their culpability, no doubt."